When I bought Swell Women last year, expanding our surf and yoga retreats from Maui to other beautiful surf destinations around the globe was my top priority. And Nicaragua was my top choice for a second location. This Latin American country is an absolute gem—near perfect surf breaks, warm water, incredible wildlife, friendly locals, and fresh markets overflowing with tropical fruit. From the moment I arrived at Hacienda Iguana for a scouting trip, I was in love. The sun was just coming up at Playa Colorado, beautiful, organized sets were breaking right outside my front door, and the white sand beaches were empty save a few early morning surfers. In a word, it was magical, and I knew this was the experience I wanted to share. 1.) The surf breaks. My passion for surfing significantly outweighs my ability, so when I travel, I’m looking for clean, friendly waves– not gigantic barrels. Even when there is a big swell and the main breaks at Colorados and Pangas Drop are huge, there are almost a dozen other breaks in the Playa Colorado area offering fun, smaller waves for beginner to intermediate surfers. 2.) Pristine environment. Close to twenty percent of Nicaragua is protected, which means abundant wildlife, lush jungle, and pristine beaches. It is stunningly beautiful. 4.) Consistent surf conditions. 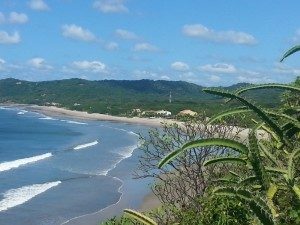 In most parts of the world, surfers have to wait for optimal swell and weather conditions—not in the Playa Colorado area of Nicaragua! Thanks to a year round deep-water swell and 300+ days a year of 24 hour offshore winds blowing in from Lake Nicaragua, there are beautiful waves sun up to sun down—a surfers dream! 5.) Adventure. There are canyons, waterfalls and volcanoes to explore, miles of white sand beaches, snorkeling, scuba diving, and of course amazing surf. 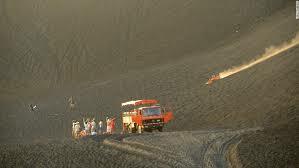 One of the country’s claims to fame is “volcano boarding”—esVolcano Boardingsentially riding snowboard style down the side of a volcano! 6.) Fresh, tropical food. Every day, I drank fresh coconut water to rehydrate after my surf sessions. 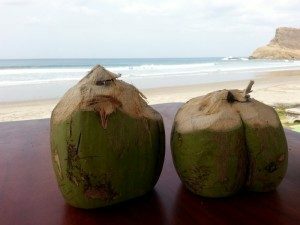 Trust me, there is nothing more refreshing or delicious than pure coconut water. 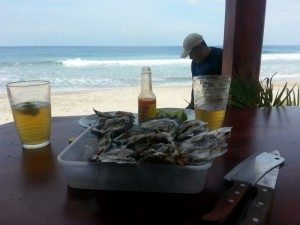 You will definitely work up an appetite after a day of surfing, and the food in Nicaragua is so delicious. Fresh oysters, fish and lobster are brought in daily from the ocean, and avocados, bananas and mangos are picked right off the trees. Oh, and did I mention excellent rum and organic, local coffee? Paradise! 7.) Culture and history. Though I could not quite tear myself away from the waves, the cities of Granada (one of the oldest cities in the Americas) and León are rich with history and culture. Colonial-style churches, art galleries, local shops, fresh markets, coffee shops, cathedrals, and restaurants showcasing traditional cuisine are all part of the charm. 8.) Few crowds. One of my favorite things about visiting Nicaragua was the lack of crowds in the water. Surf etiquette is really important for safety, especially at busy breaks. 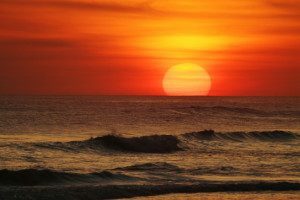 But it’s blissfully wonderful to put all that aside and just focus on catching the next wave…which you can do if you’re the only one going for it! 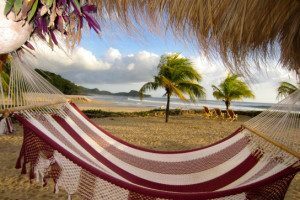 Have you been to Nicaragua? Or always wanted to go? What did you love? What do you want to do or see there? Please share your story in the comments! Swell Women is currently offering trips to Nicaragua. Please click here for dates or contact me, Lulu, with any questions.